DUKE GARWOOD, ANNA HOMLER AND SYLVIA HALLETT, THE DOOMED BIRD OF PROVIDENCE, THE WINDSORS. 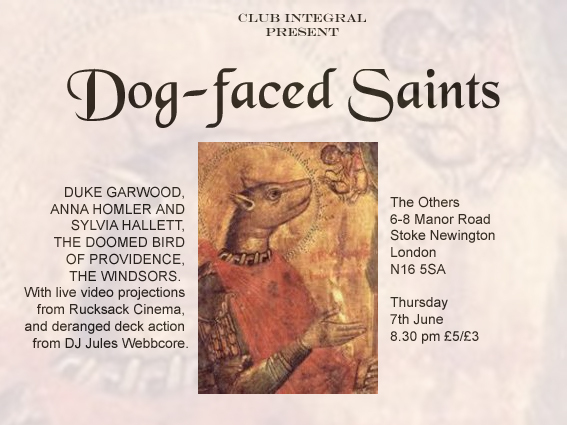 With live video projections from Rucksack Cinema, and deranged deck action from DJ Jules Webbcore. DUKE GARWOOD Duke Garwood’s first paid musical job was back in the late 80s playing guitar on The Orbs seminal Perpetual Dawn taken from their debut album co-produced by Youth. Nearly twenty years and many musical wanderings later Duke Garwood completed a circle by releasing an album on Youths new label Butterfly Recordings. Garwood’s first album Holy Week came out to great critical acclaim in 2005. Q magazine described it as making Will Oldham sound like Engelbert Humperdinck. His follow up Emerald Palace was recorded in a log cabin on the wooded slopes of Box Hill over two scorching days and nights in the mid-summer of 2005. Garwood and his long time drummer/percussionist-Paul May laid down some 40 tracks of which 18 were finally chosen for his new release. 2009 saw Duke release his first releases on Fire. The first album, “The Sand That Falls” saw Duke continue with his rootsy approach to music making with more than a handful of drone and sprawl to accompany his lone guitar. The album was preceded by the ‘He Was A Warlock’ EP, which demonstrated Duke’s fondness of releasing tracks with more than a hint of melody such as ‘Rise A Woman’, and Each Man Sparkles amidst his more sparse, experimental numbers. Duke is back for 2011 with his long awaited album ‘Dreamboatsafari’. Already being heralded by press including 4/5 by NME and featuring delights such as soothing ‘Summer Gold’, this promises to be Duke’s most focussed and effective record yet. Garwood has regularly worked with Mark Lanegan and the two musicians are planning an album together this year. He was also invited to play at the Ray Davies Meltdown Festival on the South Bank in 2011. JULES WEBBCORE Club Integral DJ Jules Webbcore has a long history in underground British music, going back to 1978 when he formed avant-garde pop group English Subtitles, who released two singles and an album on Small Wonders Records. In ’81 he formed seven piece punk jazz band Gorp who released an album and a short ﬁlm, and in ’84 founded Fever Records, releasing records by My Bloody Valentine, Edward Barton and Gasrattle among others. He went on to form Kill Ugly Pop who made it onto the front cover of Sounds and featured high in the Independent Video Charts with a trashy video shot in the old Synagogue in Brixton. He subsequently became a member of Gasrattle, playing guitar and saxophone, at the same time as touring Europe with Kill Ugly Pop alongside Bongwater. He started Grimetime with his freind Shend (Cravats) and released two singles and an album on Kill City Records. He then joined trash rockabilly band Naked Ruby on guitar, who released an album Nothin’ But Dirty Lowdown Trash on Go Baby Go Records. Jules set up South London Slags at The Ritzy, Brixton, putting on film and live music, and has been a regular DJ for Kroon Kat Lounge, Go Baby and Nasty Grind playing obscure lounge, R’n’B, Soul, ska, garage punk and rock and roll. He is a resident Club Integral DJ alongside Chris Cornetto and Katrina Townend, where he plays a heady mix of avant-garde progressive rock, wild exotica, soundtracks, weird jazz and obscure library music. RUCKSACK CINEMA Rucksack Cinema a.k.a. Jaime Rory Lucy has been supplying delirious, innovative live video imagery for Club Integral and other events since 2007. His astonishing and almost preternatural ability to mix imagery with what is happening on stage as well as creating strange and wonderful atmospheres throughout a room has made him an intrinsic part of any Club Integral event. Jaime had a long history working in the music industry as a tour manager for many groups of notoriety throughout the eighties and nineties, before retiring from the road to become an East End flaneur art fag par excellence. He has worked in venues as various as Whitechapel Gallery, Hackney Empire and Cafe Oto with artists as diverse as Fred Frith, Spaceheads, Graham Massey and Eugene Chadbourne. He has recorded videos for many artists, most recently for Orchestre Murphy for their nomination in 2010 for the Art Foundation Music Awards. In his spare time he has also been known to add his bass profundo to a punk choir active on the east London bohemian scene.